Have young children? You might want to check this out, particularly if they’re taking their first steps on the Web right about now. 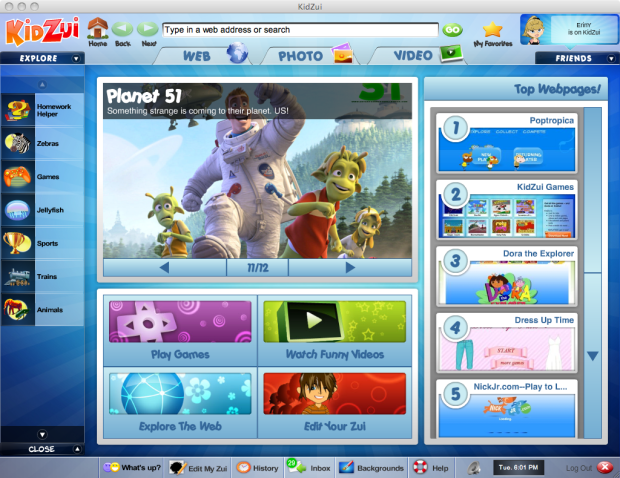 KidZui, the web browser that’s built for kids, is today launching KidZui 5.0, featuring more functionality for parents and children to discover and share the Internet together. With one click, children can now send KidZui-approved videos, websites, and pictures to their parents with the browser’s new built-in ‘KidConnect’ capabilities. Parents can now also easily send content directly to their children to return the favor. Essentially, KidZui aims to maximize parent and child computer screen time as an opportunity to connect and converse with each other through shared content online. KidZui says it currently boasts over 2 million games, websites, photographs and videos, and that all of them are approved jointly by parents and teachers.